fall through in the past year alone. The lack of action has the Albuquerquean questioning if he should even continue fighting. Padilla will be partaking in his first action since his first and only career loss 11 months ago, a unanimous decision to Nick Rhoads. “I always wanted to fight freely and have a good time but fighting at home there’s always a lot of pressure whether I’m undefeated or not,” he continues. 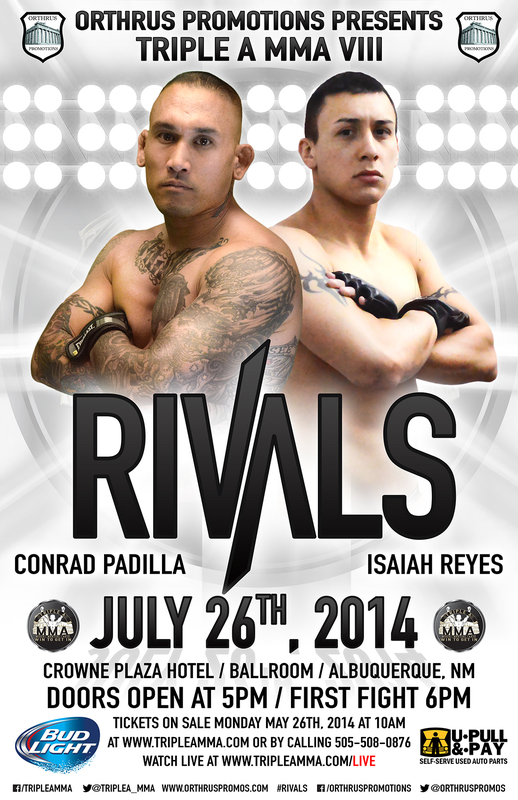 On July 26th, he will be taking on FIT NHB’s Isaiah Reyes on Triple A MMA’s “Rivals” card at the Crowne Plaza Hotel in Albuquerque, New Mexico. The bout will pit fighters from two best gyms in the state, a match-up that is rarely seen. Despite the animosity that sometimes exists in crosstown rival bouts this one is anything but that. Both men have expressed a great deal of respect for one another and even more gratitude for being in the main event.